Click here for our wellness blog! 9th Annual MPMC 5 Miler Registration Open Now! 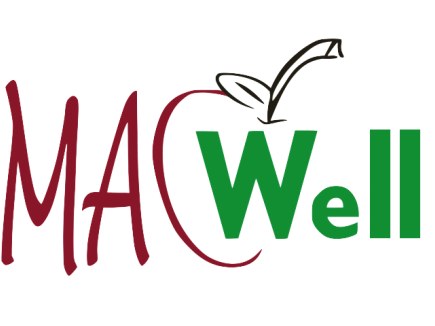 The Mercersburg Area Council for Wellness (MACWell) is a non-profit organization founded to create and support a groundswell of personal and community commitment to making the Mercersburg area a place that inspires its population to live well. Just as the family you're raised in affects your health choices, the environment in which you live impacts the choices you make. The area's natural beauty and abundant outdoor space, access to local produce and markets, a town with walkability and nearby areas that are inviting for hiking and biking make Mercersburg a community that can inspire its population to live well. We can hear the birds and the stream as we walk! Picture wild flower fields along the stream side trail! Above photo of Dr. Liz's field with wildflower seeds from Agronomy, Inc.! Thank you JBHS Honor Society Students for your amazing energy and teamwork clearing the way for the future community trail! 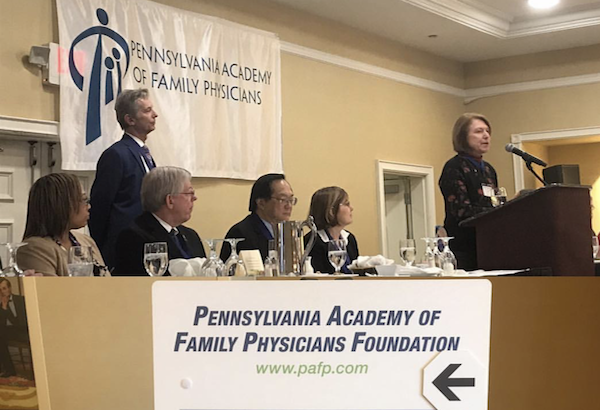 ​Congratulations to Dr. Elizabeth George for being recognized by The Pennsylvania Academy of Family Physicians as the inaugural 2019 Public Health Award recipient! "She's very passionate about community and health and wellness, and is very deserving of this award!" Volunteer at our events and activities! ​​We are a 100% Volunteer Organization. ​​Contact us @ mac4wellness@gmailcom and donate your time! 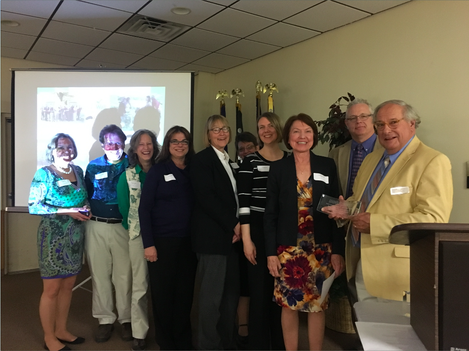 Winner of the 2016 Not for Profit of the Year award from Tuscarora Area Chamber of Commerce! Pictured - from the Left - Patti Nitterhouse HEA Host, developer Penn National Golf Community; Kenn Speaks HEA Coach, Speaks DJ; Chris Mayer HEA Host at Wilson College, director CSA; Laura Puckett, Board member; Claudia Peet Board member, Director of Medical Library Summit Health,staff education coordinator; Shelby Miller HEA coordinator; Elizabeth Grant - Board member, Franklin Cty Planning Commission; Elizabeth George, MD MACWell President; Jim Butler Everyday Chef educator, Dining Service Director at Mercersburg Academy; Mayor Jim Zeger - MPMC team. 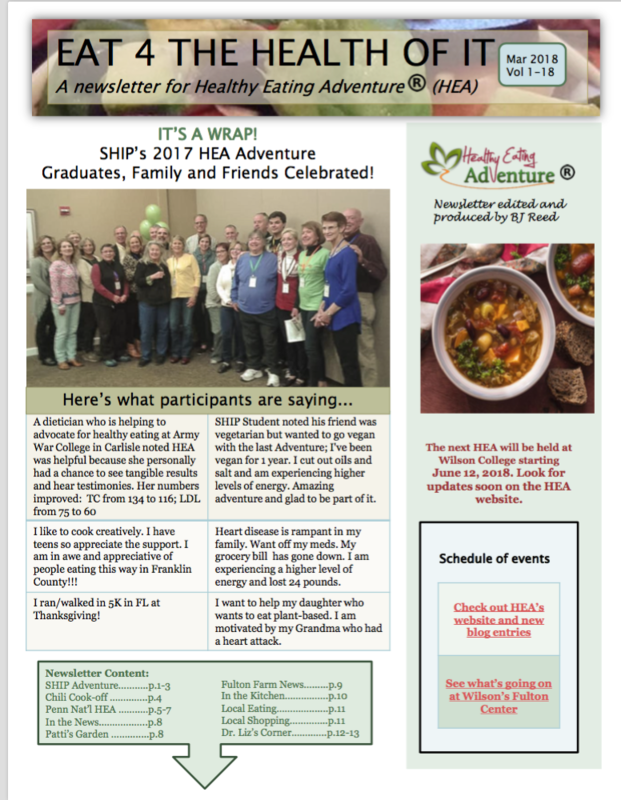 Fun Fitness opportunities in our area! Be a part of creating a vibrant and healthy community! There are plenty of ways to get involved and we love hearing new ideas! Did you know that Mercersburg has a beautiful stream running through it? and how our community can work together to promote Individual Wellbeing, Community Connectivity and a Sustainable Environment. 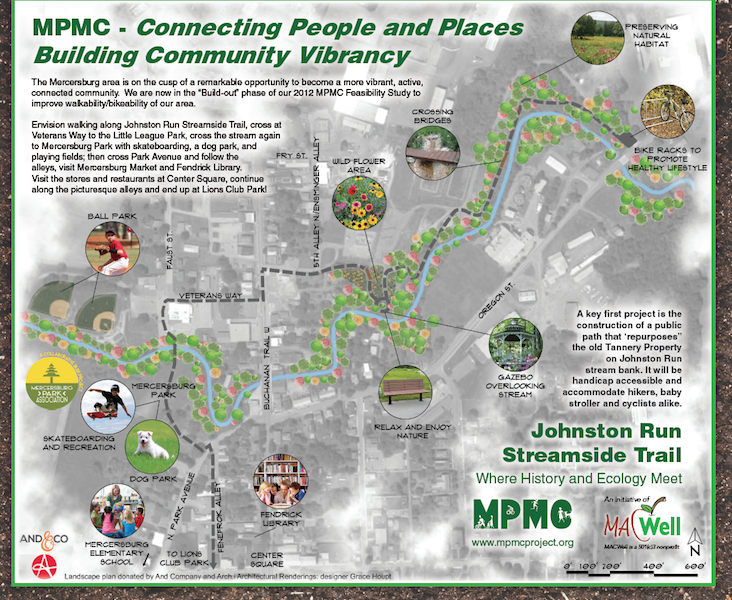 Johnston Run MPMC 8th Annual 5 Mile Run/Walk is Saturday May 12, 2018! Register Today! Have fun taking on healthy eating habits to last a life time!